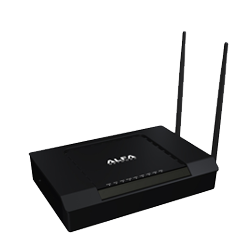 The AIP-W525H from ALFA Network is a high-power WLAN router for large ranges with 2 x 2 MiMo in the 802.11 b / g / n standard. The router achieves data rates of 300 Mbps and supports passive power over Ethernet. With 300MBit/s data rate, 2 x 2 MiMo Antenna Technology, a maximum of 600mW output power (Export) and superior input sensitivity, the AIP-W525H from ALFA Network has all the features to connect all of your devices without interference with your network. Simply connect the AIP-W525H to your DSL modem via the WAN Ethernet interface, and the router then connects all your devices to the network. For this you can either use the WiFi interface or for wired devices, connect them to the four Ethernet ports. The transmission power of the hardware is to be set in accordance with the legal regulations in your country. For Germany and the EU for 2.4 GHz wireless devices with antenna a maximum EIRP of 100mW or 20dBm as limit. Please use the device in Germany only with the countries Zone ETSI or the regional setting for Germany to ensure compliance with the limits. The operation of a signal amplifier (for example antenna) is possible and also allowed, however, in combination with this the max. transmission power must not be exceeded.